For the 5th time in 7 events on the WCT this year, Kelly Slater ended up on top with another near flawless performance at Trestles this week. Slater narrowly edged out Taj Burrow in the final heat today on his way to winning the 2008 Boost Mobile Pro. Taj came out absolutely firing at the beginning of the 40 min. extended final and quickly put the 8x world champion in a combo situation. It was looking pretty glim for the champ, however as Kelly has done so many times throughout his illustrious career, he stayed cool and came back to clinch the victory in the closing minutes. Taj in fact did have Kelly, and really probably should have had Kelly. With under two minutes left in the final, Taj was still holding a sizable lead as Kelly was looking for a score of 8.93 to combine with the 9.7. Taj held priority as time ticked away but decided to let Kelly take-off on a wave he didn’t feel would give-up the score Kelly was looking for. He was wrong and Kelly proceeded to shred his way to a 9.27, and in doing so sealed his 3rd Boost Mobile Pro victory, as well as a hefty $75,000 worth of prize money which Bob Hurley sweetened with an extra $45,000 today. Taj surfed absolutely out of his mind throughout the event at Trestles, Kelly is just on a run right now like none we have ever seen before and this come from behind win was as spectacular as any. Not to mention his full-on barrel this morning at Trestles, a wave that isn’t really known to give up barrels, ever. 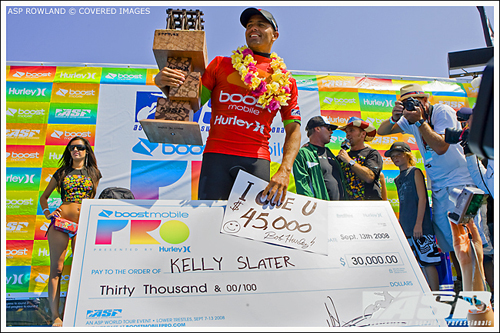 Congratulations Kelly Slater, the 2008 Boost Mobile Pro Champion! On a side note, Kelly was also given the keys to the city of San Clemente tonight at a special beach event hosted by Hurley and Boost Mobile, which saw surfer/musician Timmy Curran perform a free concert as well as a special screening of Bustin’ Down the Door. Posted by Shaun	on Thursday, September 11th, 2008	in Surfing. I’ll admit, when Kelly got combo’d that early on I counted him out. Once he got the 9.7 I knew he was back in it. I still can’t believe he won. That was some of the most incredible suring competition I’ve ever seen.